I have an almost perfect 2008 Honda Foreman for sale. 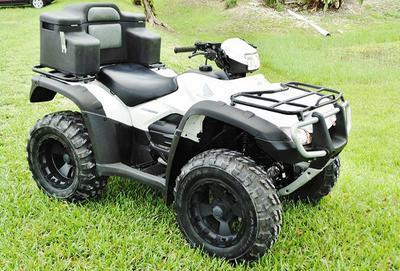 The Honda FourTrax Foreman 500 4x4 is white with black accents and is in super used condition with only 78 miles speed governed ones! I think the black and white color option is much more attractive than traditional "Honda Red" or Camo, don't you? Everything on this Foreman works perfectly including the semi-manual transmission, the hard-working engine and the amazing 2x4 / 4x4 system! This used Honda Foreman just had a tune-up and is probably the best deal going online. I doubt there is another one around with such low mileage in addition to the upgrades and great condition! GoGoCycles encourages our visitors to take a moment to review the used Honda ATVto help those who want to buy a used Foreman 4X4 make informed decisions and to benefit the biker community as a whole. 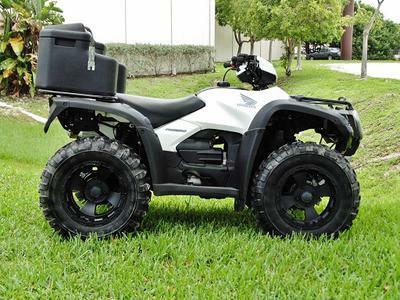 The 2008 Honda Rancher for Sale is in Hialeah FL Florida and I think that you will find that my asking price for it is very fair considering its mileage and condition. If you would like to take a look or if you have more questions about it please email me KirstenRathodst "at" aol "dot" com and mention that you found my classified on GoGoCycles used ATVs.